I’ve been putting off this post for many months now and I don’t know why. I can’t think of any reason, other than it was such a fantastic trip I don’t know where to start. That’s my excuse anyway and I’m sticking with it! 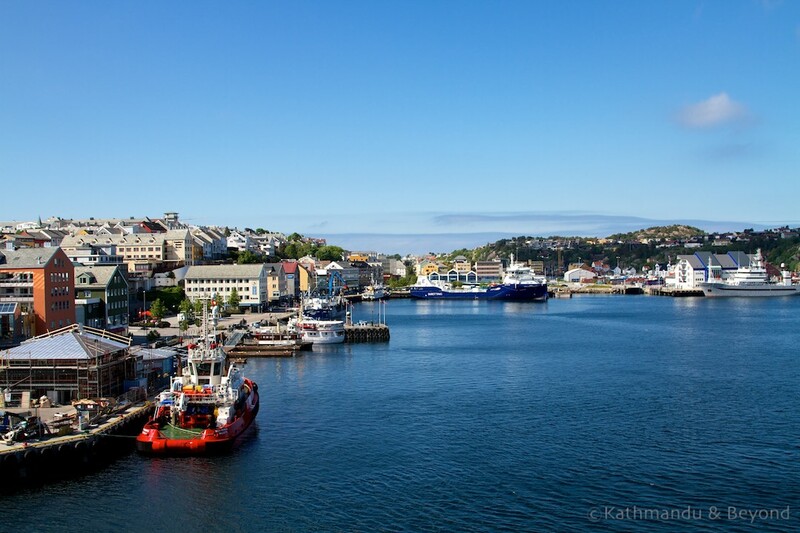 Last June, we voyaged along Norway’s Atlantic Coast on one of Hurtigruten’s ships, the MS Midnatsol, travelling from Kirkenes in the far north of the country to Bergen. We had received the most generous invitation from Mark’s parents to join them in celebrating their 50th wedding anniversary and we immediately deviated from our Eastern European travel plans to do so. Who wouldn’t?! 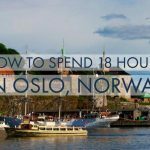 We had arranged to meet them in Kirkenes so we flew to Oslo the day before to check out this notoriously expensive capital city and see how little money we could spend in 18 hours in Oslo! We flew north to Kirkenes the following morning which gave us most of the day to explore the town ahead of Mark’s parents’ arrival later that afternoon. At this northerly point in Norway, we were further east than both Istanbul and St. Petersburg. In fact, we were so close to the Russian border that some of the road signs around the town were in Cyrillic. 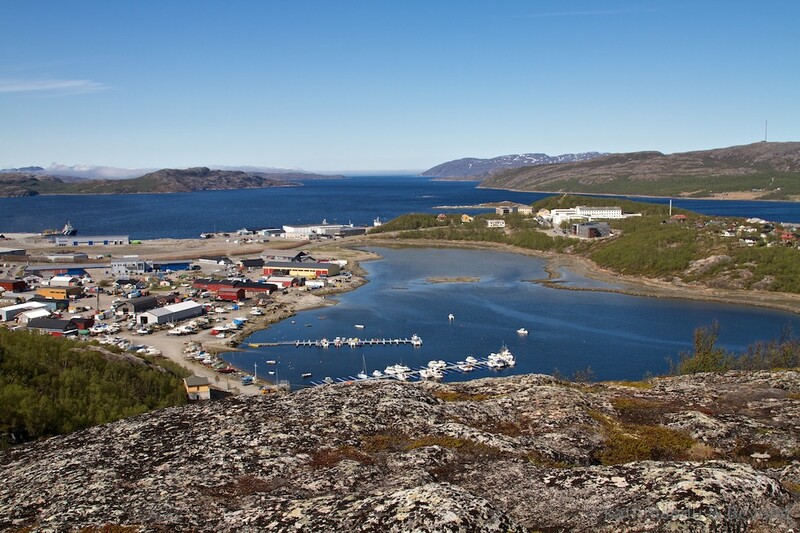 There’s not a lot to see or do in Kirkenes but we climbed the hills behind the town for a view across the Barents Sea and just a tiny taste of the spectacular scenery that was to come. 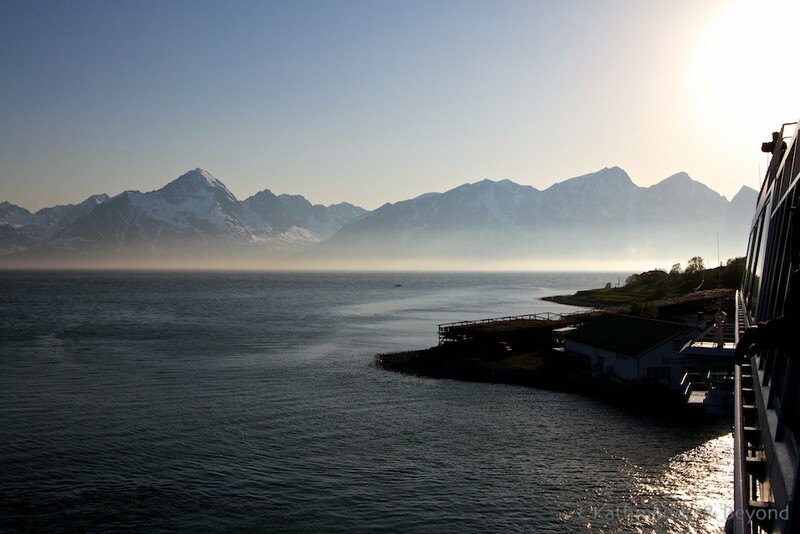 That evening, after Mark’s parents had arrived, we enjoyed a glass of red wine with some reindeer casserole and slept well despite the fact darkness hardly fell due to being so close to the Arctic Circle. The next morning we were transferred by a Hurtigruten bus to the Midnatsol where we settled into our cabins (more on the ship later). One of the reasons Hurtigruten maintain they aren’t a conventional cruise company may be because in addition to the many tourists on board, their ships serve a very important secondary purpose: for over 120 years, they have been carrying passengers and freight to remote and otherwise unreachable parts of Norway. 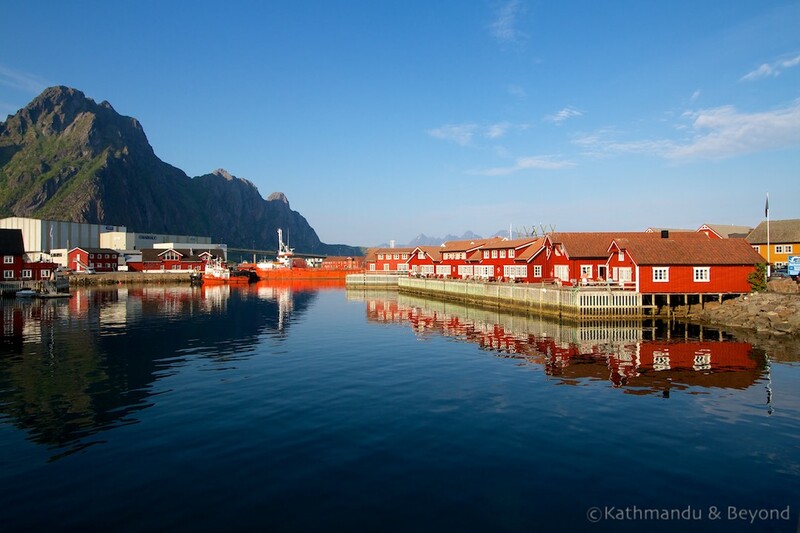 The history of Hurtigruten (which means ‘fast route’) is both fascinating and hugely significant in the history of the region’s fishing waters. You may notice that I’ve not used the word ‘cruise’ to describe our, well, cruise. That’s because Hurtigruten makes a point of saying they offer ‘voyages’ and not ‘cruises’. The dictionary definition of a cruise is ‘to take a holiday on a ship or boat following a predetermined course, usually calling in at several places’, so I’m not sure why we weren’t allowed to call it a cruise because that’s exactly what we did. I suspect it is because they don’t want to give the impression that they provide a luxury cruise à la P&O or Fred Olsen and are merely managing expectations. 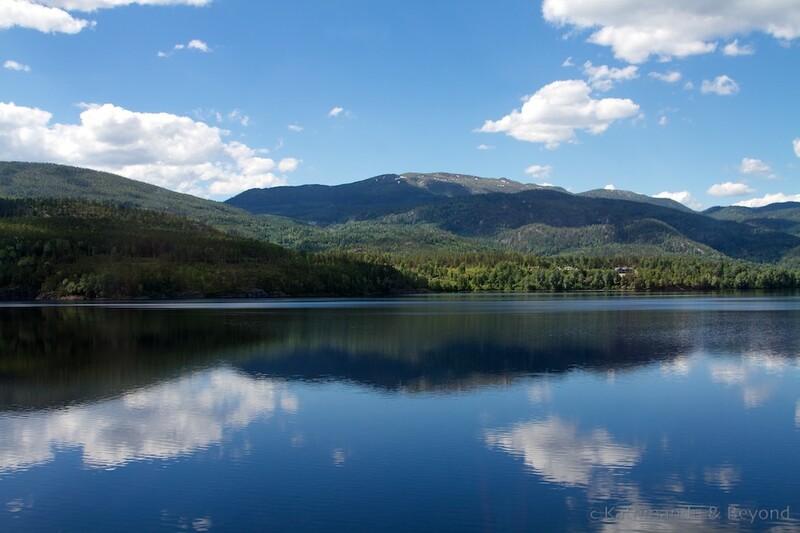 The boat journey certainly carries the price-tag of many luxury cruise liners but then Norway is one of the most expensive countries in the world! 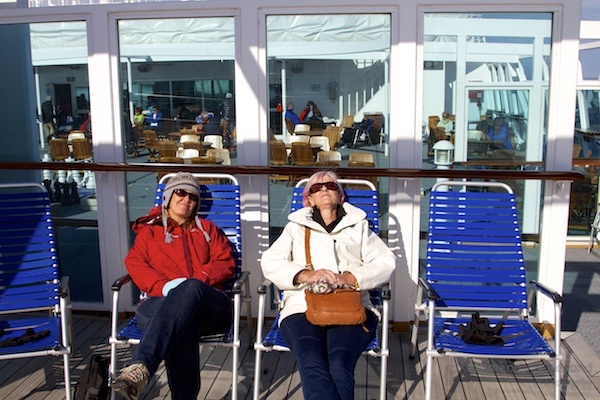 In reality, Hurtigruten ships are posh ferries – they are of a high standard and very comfortable but don’t provide the luxury touches or lavish entertainment commonly associated with a cruise. Thank goodness. 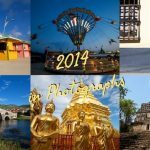 I could attempt to describe the spectacular scenery we saw each day in great detail but I am a true believer of the (some may say lazy) statement ‘a picture tells a thousand words’ so I will let our images do most of the talking here. Needless to say, the scenery that unfurled before us on a daily basis was overflowing with superlatives. We were close to the Arctic Circle and this was the ‘land of the midnight sun’ where at the height of the summer the sun barely sets and there are almost twenty-four hours of daylight. This in itself was a novelty and this natural phenomenon really is quite phenomenal! The sun not quite setting! 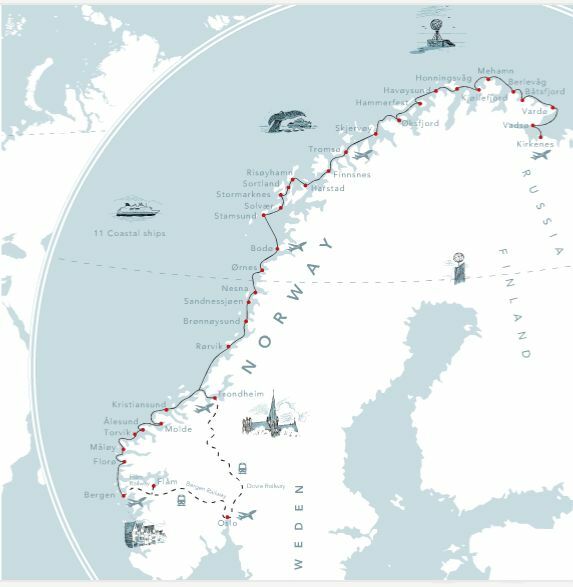 Because Hurtigruten ships also act as ferries, collecting and delivering supplies between hard-to-reach parts of the country, many stops are made throughout the voyage. However, some are for only ten or fifteen minutes; just enough time to load or unload her cargo. Some stops are for longer and passengers are permitted to leave the ship for some quick exploration; quick being the operative word here. One of the slightly frustrating things about the trip was the limited time available to get off the ship at port calls. Some stops were so quick, passengers weren’t permitted to leave the ship at all. 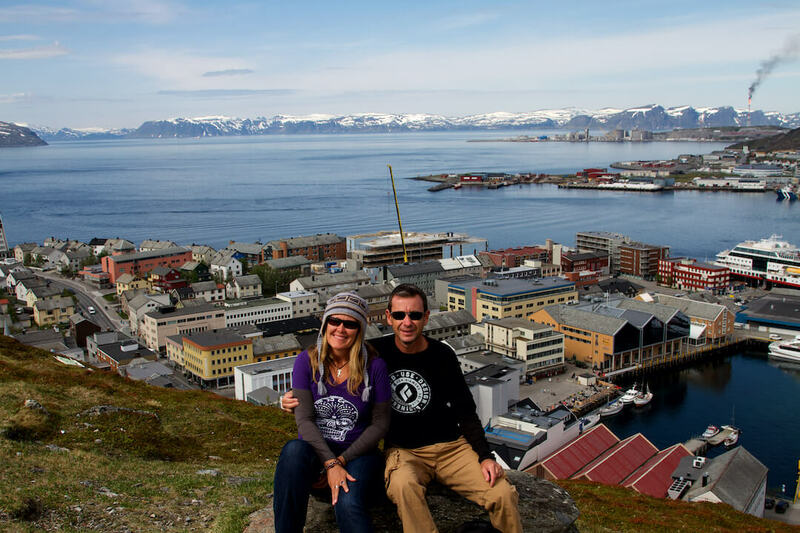 One of the first significant stops we made was at the village of Vardø, Norway’s easternmost town. In Vardø, we saw some unusual architecture including the town’s very tall, modern cathedral and a monument which commemorates the ninety-one men and women who were tried for witchcraft and burnt at the stake here in the 17th-century. 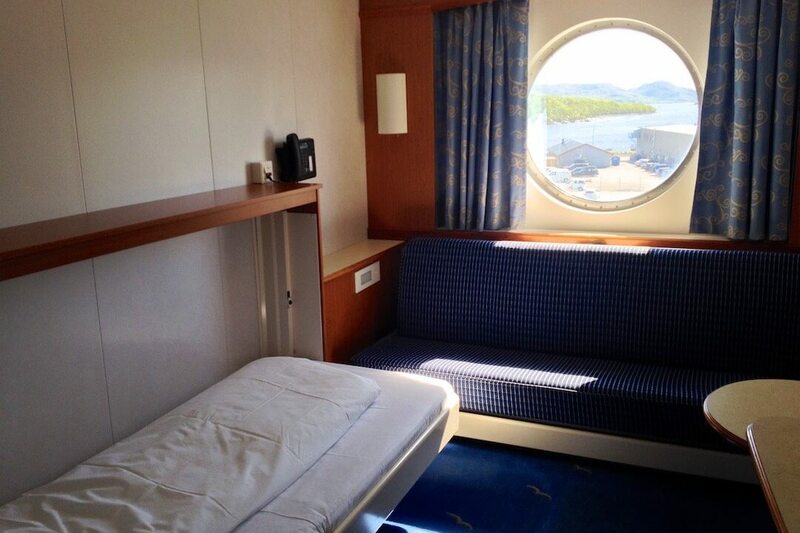 Although Hurtigruten offers many optional excursions, this was the only one we took during our trip. 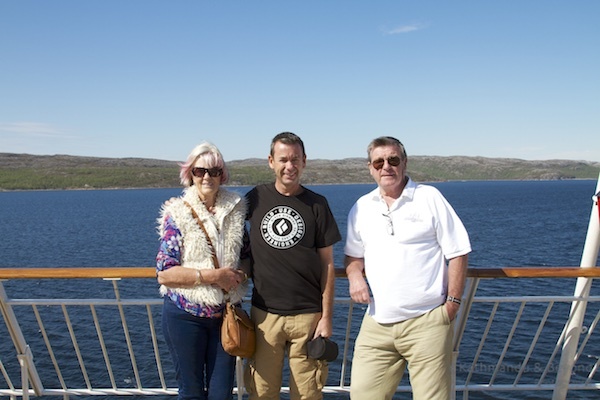 Mark and I were keen to visit Hammerfest (for the reasons mentioned above) but generally we found the excursions expensive and rushed and we were all happy to enjoy the scenery from the comfort of the ship’s deck with a suitable beverage in hand. 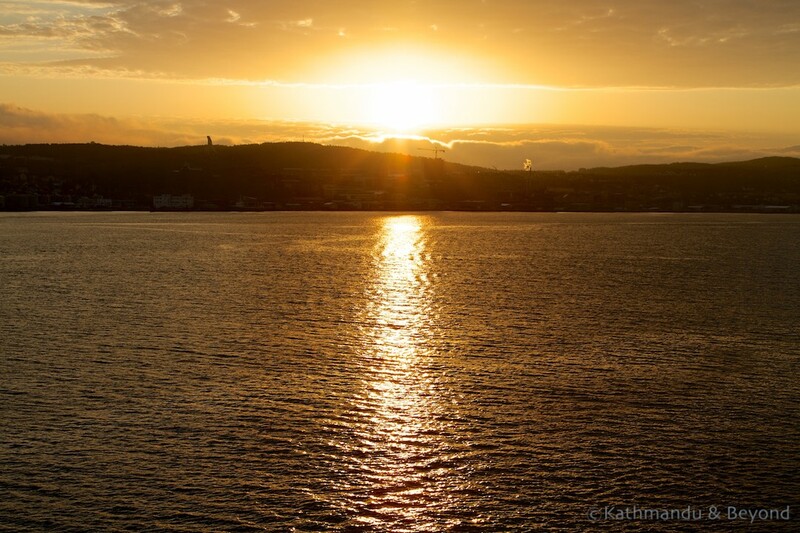 At the end of the day, we docked in Tromsø and those passengers who had opted to attend the midnight service at the cathedral did so, whilst we watched the midnight sunset from the deck of the Midnatsol with a glass of red wine! 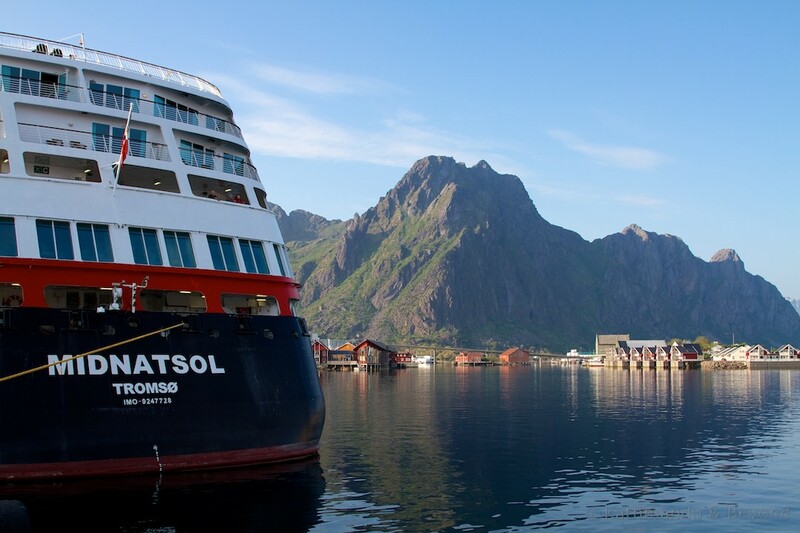 The third day was billed as the highlight of the voyage as we passed through the stunning Lofoten Islands, an oceanic warren of inlets and isles, and made a detour into the dramatic Trollfjord. 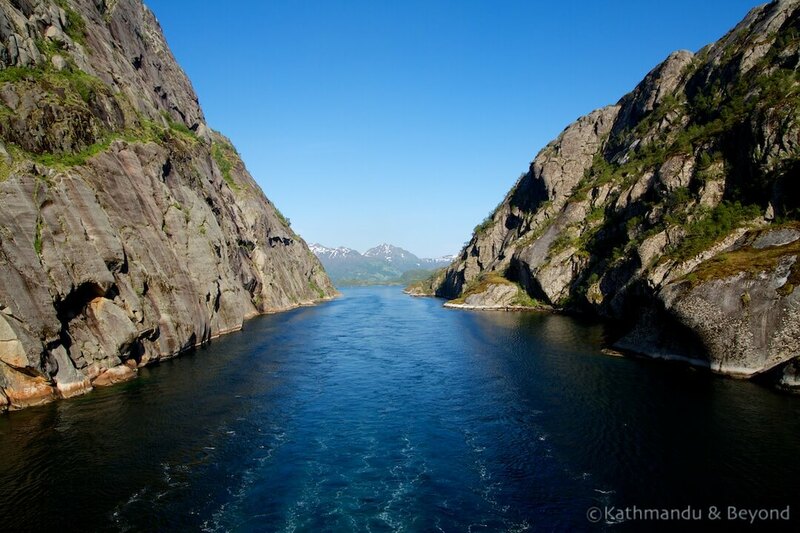 This fjord is two kilometres long but at its narrowest, only one hundred metres wide. With such steep mountainsides, it’s hard to imagine that a ship as big as ours would squeeze through, but of course she did. It felt like we were close enough to touch the cliff faces but unbelievably the ship’s beam is only 21½ metres so we clearly had plenty of space to manoeuvre! Later that evening we made a stop at Svolvær which I thought was one of the prettiest towns we visited throughout the trip. I loved the way the colourful wooden houses reflected on the water against the mountain backdrop. There wasn’t much going on in Svolvær but if we’d had more time, I would happily have spent a day or two in one of the stilted bungalows. 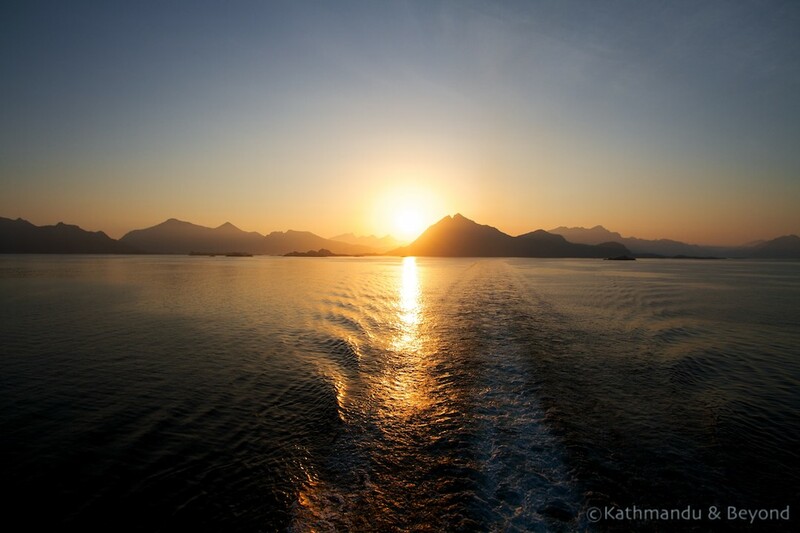 The following morning we sailed along the Helgeland coast before crossing the Arctic Circle. As we did so, the weather took a turn for the worse and the clear blue skies we’d been lucky enough to have up until this point were replaced by cloud. As we crossed the Arctic Circle, all passengers were invited to the deck for a strange ‘crossing the line’ ceremony which involved some very disgusting fish oil, a shot of strong alcohol and a commemorative spoon! By the time we arrived in Trondheim on the morning of day five it was raining quite heavily. But Trondheim was the largest town we’d seen since leaving Oslo and also reputed to be very attractive so we donned our waterproofs, opened our umbrellas and went walking through the puddles. I will always maintain a place looks much more attractive when the sun is shining; consequently we only took a couple of photographs! Thankfully the clouds lifted later in the day in time for our stop at Kristiansund. Situated on the scenic Atlantic Road, the town apparently holds the rather obscure title of Norway’s ‘cured cod capital’. 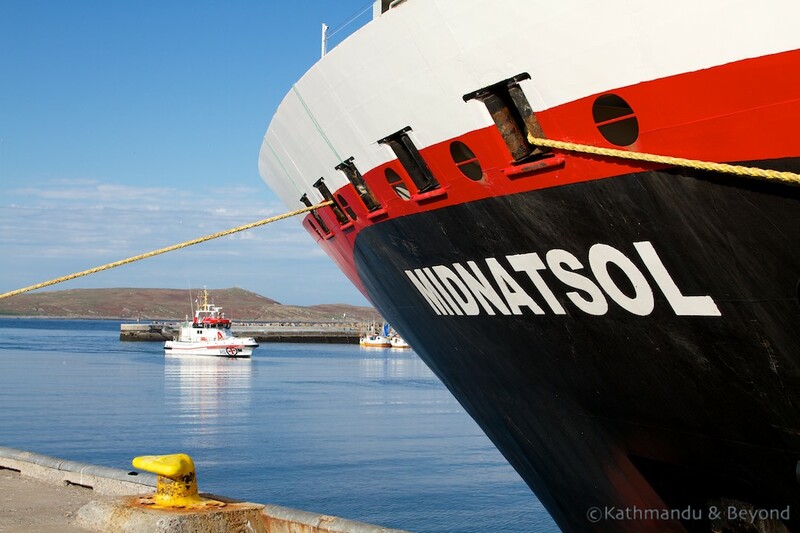 On the sixth day of our voyage, the Midnatsol arrived into the large harbour at Bergen, our disembarkation port. We stayed the night in Bergen in a hotel overlooking the pretty harbour and historical Bryggen wharf beyond it. Dominated by a row of vibrantly coloured wooden houses, 13th century Bryggen is another of Norway’s eight UNESCO World Heritage Sites and is protected as one of North Europe’s oldest port cities. Unfortunately, the weather in Bergen wasn’t as kind to us as we would have liked, but for the most part, it stayed dry and we had fun exploring the labyrinth of alleyways that lead back from the wharf and which are filled with boutique shops, cafés and more colour. 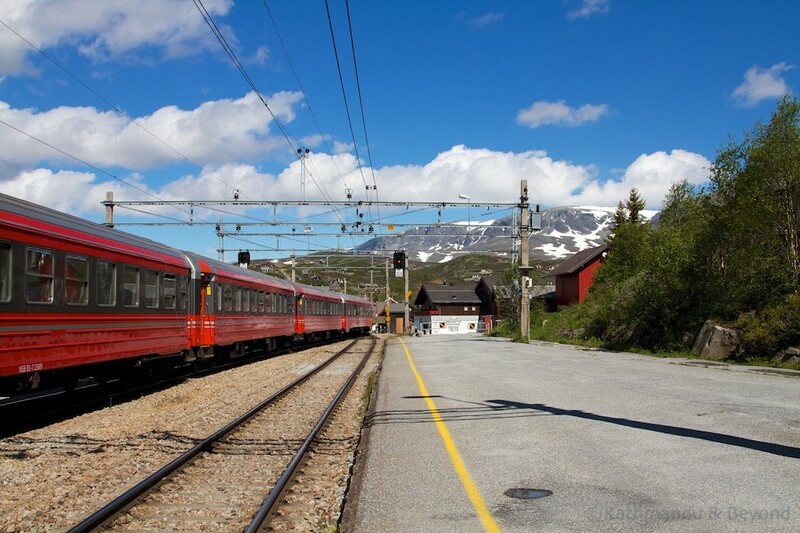 Our Norwegian adventure was nearing an end and on our final day we took the train from Bergen back to Oslo. This six-hour railway journey is considered one of the world’s most scenic train rides. 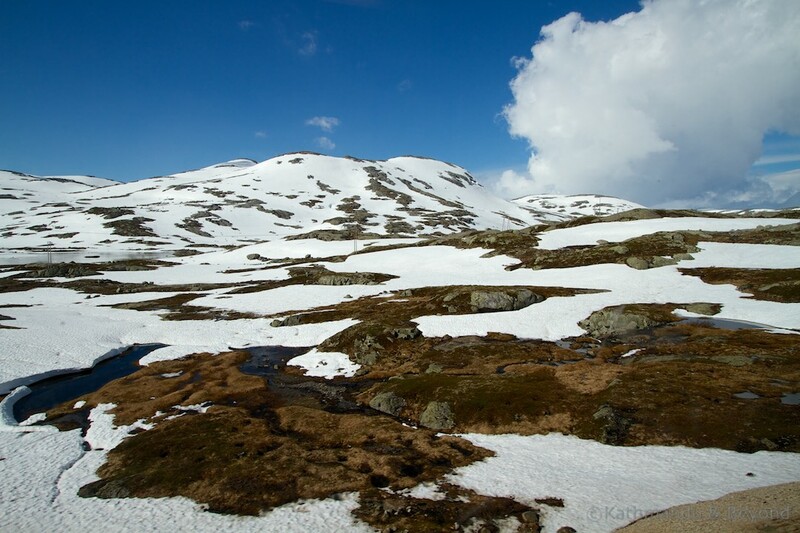 It’s certainly one of the most scenic rides we’ve done with deep blue lakes, alpine scenery and plenty of snow on the ground even though it was June. Before we knew it, we were back in Oslo, at the airport saying our farewells to Mark’s parents before their flight back to the UK and our flight to Prague, to continue our travels through Eastern Europe. Would we do it again? Absolutely! 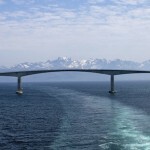 If we did, though, we would consider taking a car and using the Hurtigruten ship like the locals do; as a ferry. 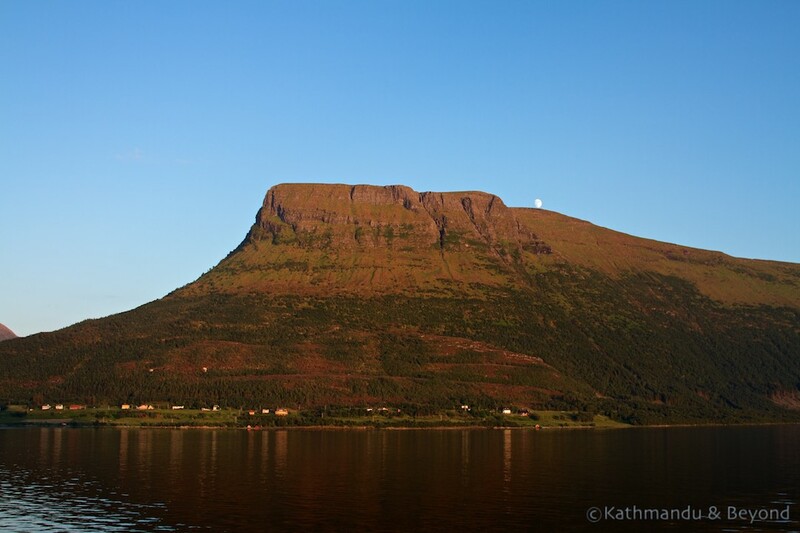 The scenery from the ship was stunning but it would be fantastic to spend a few days exploring some of the islands. Oh, and seeing the Northern Lights is still on my bucket list so there’s another reason to go back! We travelled on the aptly named MS Midnatsol which is one of Hurtigruten’s newest ships, built in 2003, and one of a fleet of thirteen. Our cabin was more spacious than we were expecting, with two separate beds, one of which folded away to become a sofa. Another surprise was how well appointed the bathroom was – we were expecting a handheld shower that flooded the bathroom every time it was used but our cabin had a proper shower cubicle. We had an outward facing cabin with a large porthole and it was great to be able to wake up, check out the view and rush up on deck with camera in hand. That being said, we spent limited time in our cabins and you can pretty much guarantee the scenery will be photogenic whatever the time of day. OMG as some of our fellow American passengers would say! 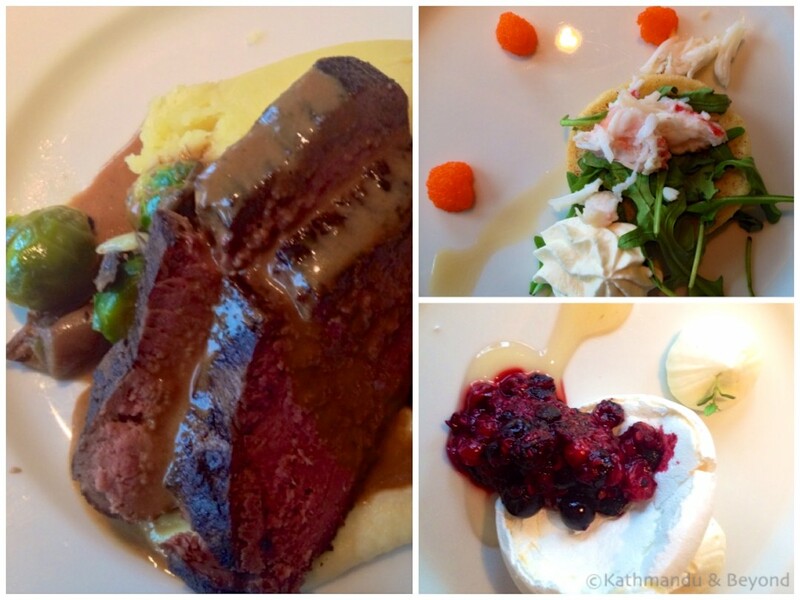 We’ve never been on a ‘cruise’ cruise so can’t make comparisons in quality or quantity but we certainly didn’t go hungry* and the food was delicious. 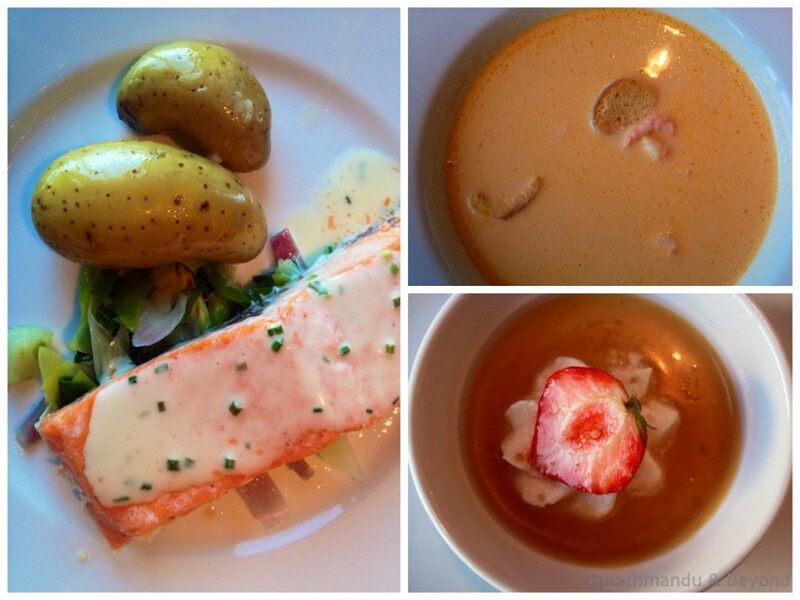 We pre-booked full board which included three daily meals. Breakfast and lunch were extensive self-service buffets and dinner was a three course set meal served at the table featuring food local to the region we were passing through. Tea and coffee were included but drinking water at dinner wasn’t. The lack of provision of free drinking water was one of my only complaints – I always resent paying for over-priced drinking water and this was no exception. Actually there is a way you can get a “free” small bottle of drinking water and that is to buy a bottle of wine! 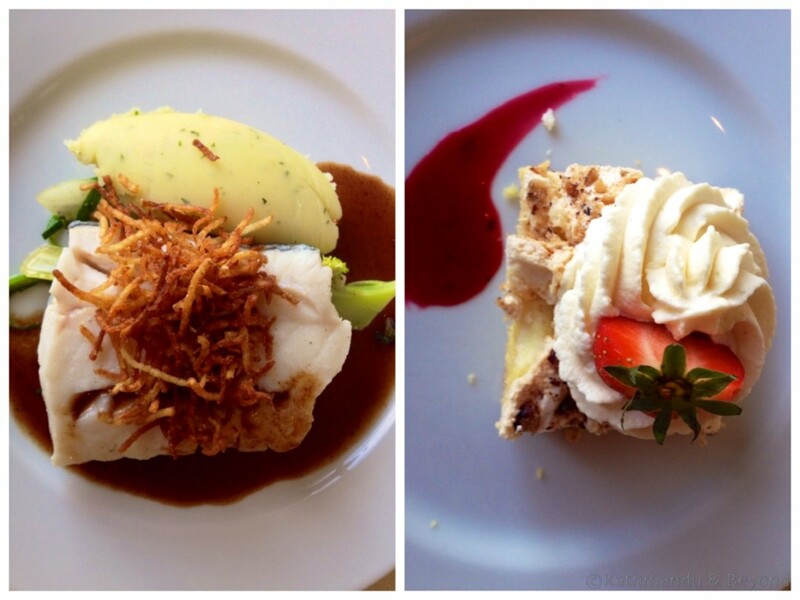 * That is a bit of an understatement – we gorged ourselves at every meal and ate far too much! Yes, in public areas and a little patchy in places. Not super-speedy but it should be good enough to get a few snaps up on Facebook or Instagram or email friends and family back home to tell them what an amazing time you are having. There’s no charge for using the wi-fi. 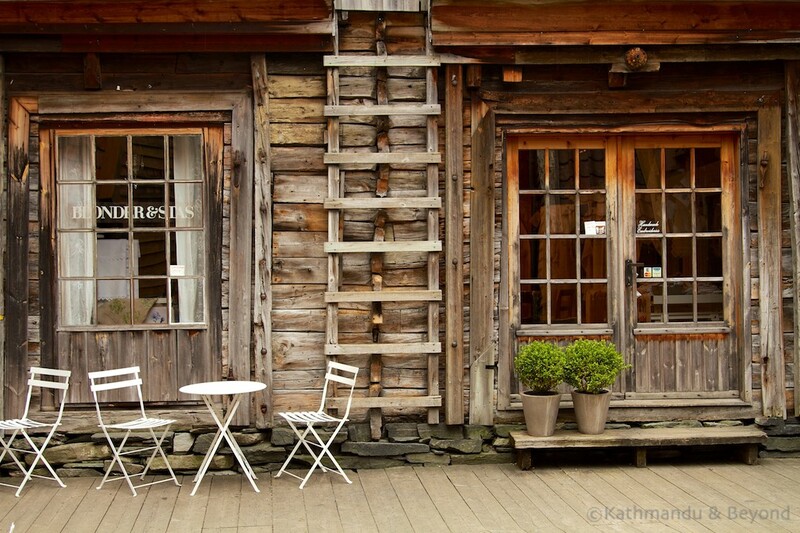 Yes, Norway is mighty expensive! But it’s definitely a destination worth splurging on. 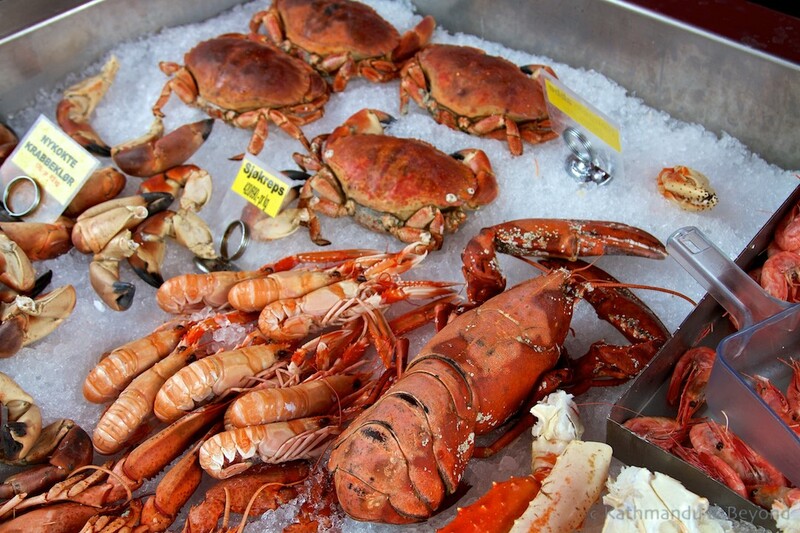 During our time in Oslo, we found ways to cut costs but once on the ship, you are held to ransom by the onboard prices. The best thing to do is be prepared for them and either take the attitude ‘well, we’re here so we might as well enjoy ourselves’ or … give up alcohol for a week! BYO – Can I take my own alcohol on board? Hurtigruten’s alcohol policy appears to be getting stricter and stricter by the year: a friend who sailed with them around a year before our voyage was able to sneak a glass of her BYO wine into dinner in her coffee refill mug. By the time we travelled, coffee refill mugs had been banned in the dining room (presumably the staff had got wise to this trick). However, we were permitted to bring a limited amount of alcohol on board (around one bottle of wine per person – how long does that last!?) which could only be consumed in our cabins. A pre-dinner game of cards and a couple of glasses of red became our routine (no white as no fridge). And OK, maybe we managed to sneak a little more than one bottle each on board! However by the time I did a little research for this article, it seems that now only alcoholic drinks purchased from the ships restaurants and bars can be consumed anywhere on board. 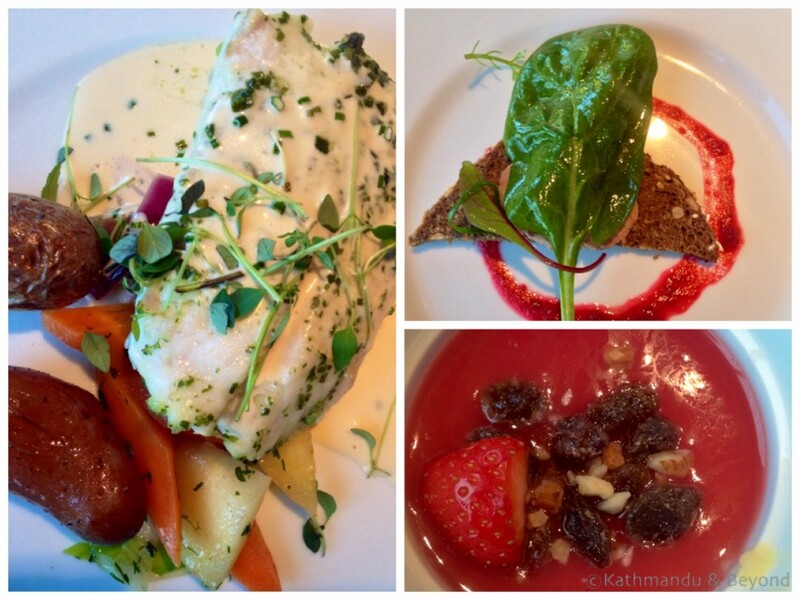 How much does a drink cost on board a Hurtigruten ship? Not cheap, but this is Norway and prices didn’t appear to be inflated over and above what you would pay on land. Sample prices: tea and coffee: £2.80, bottled water: £3.60, fruit juice: £2.50, draught beer (0.4 litre): £6.60, a glass of house wine: £7.70, bottle upwards from £37.00. If you prefer to think more in US dollars, or euros come to that, up these prices by one-and-a-half to get a rough approximation. The restaurant meals were great. However, it’s a lot of food and if you were looking to make budget cuts, you might consider only taking breakfast and dinner. Breakfast is so huge if you have a late breakfast, you could almost last until dinner. There is also a cafeteria style café on board for lighter meals. The really frugal could bring lunchtime snacks on board with them. Beforehand, I’d read suggestions on forums like TripAdvisor to visit local supermarkets when in port to stock up on snacks and drinks (both soft and alcoholic) but we didn’t actually get a lot of opportunities to do this – just one that I can recall – although it may vary depending on the schedule of the sailing. The ships have laundry rooms where you can use the token-operated washing machines. Useful if you travel light like us. Thanks for your comments. And, just so you know… Mark and I are ready to go searching for the Northern Lights whenever you are! What I am wondering is whether you found yourselves sleeping less with the paucity of darkness and the desire not to miss the wonderful scenery on the route. I think I would be tempted to stay awake as much as possible, although I’m not at all good at that. Definitely! The broad daylight at midnight certainly played havoc with our body clocks but as you say, the amazing scenery combined with the novelty of the sky not getting dark had me peeking through the port hole constantly throughout the night!